[148 Pages Report] The global silage additives market was valued at USD 1.55 Billion in 2016; this market is projected to reach USD 2.00 Billion by 2022, at a CAGR of 4.40% from 2017 to 2022. The silage additives market has been segmented on the basis of type, silage crop, function, and form. It has been further segmented on the basis of region into North America, Europe, Asia Pacific, South America, and the Rest of the World (RoW). The main objectives of the report are to define, segment, and project the market size of the silage additives market with respect to the above-mentioned segmentations and provide a detailed study of key factors influencing the growth of the market, along with profiling the key players in the market and their core competencies. This report includes estimations of market sizes for value (USD million) with the base year as 2016 and forecast period from 2017 to 2022. Top-down and bottom-up approaches have been used to estimate and validate the size of the silage additives market and to estimate the size of various other dependent submarkets. Key players in the market have been identified through secondary sources such as the Agriculture and Horticulture Development Board (AHDB), the US Department of Agriculture (USDA), and the Food and Agriculture Organization (FAO), and their market share in respective regions have been determined through primary and secondary research. All percentage shares, splits, and breakdowns have been determined using secondary sources and were verified through primary sources. 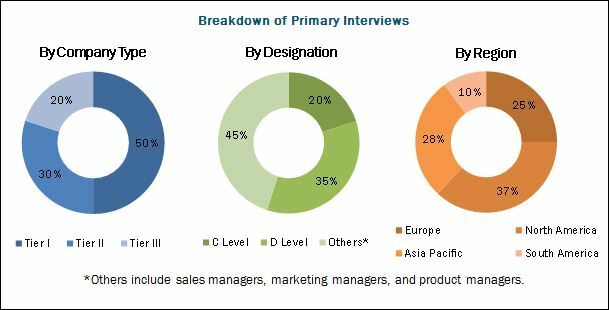 The market ecosystem includes key manufacturers and service providers in this report such as Volac (UK), Trouw Nutrition (Netherlands), Schaumann BioEnergy (Germany), ADDCON (Germany), Chr. Hansen (Denmark), BASF (Germany), Lallemand (US), DuPont Pioneer (US), Micron Bio-Systems (US), Biomin (Germany), American Farm Products (US), and Josera (Germany). With the given market data, MarketsandMarkets offers customizations according to the company’s specific scientific needs. Further breakdown of the Rest of Europe market for silage additives into Poland, Denmark, and the UK. Further breakdown of the Rest of Asia Pacific market for silage additives into Indonesia, the Philippines, Pakistan, Thailand, and South Korea. Further breakdown of the Rest of South America market for silage additives into Chile, Venezuela, and Uruguay. Further breakdown of other countries in the RoW market for silage additives into the Middle Eastern and African countries. The silage additives market is projected to grow at a CAGR of 4.40% from USD 1.62 Billion in 2017, to reach USD 2.00 Billion by 2022. Due to the increase in production of silage across the globe, silage additives have been gaining preference for their characteristics of improving silage quality, the shelf life of silage, and enhancing the productivity of livestock. On the basis of type, the inoculants segment is projected to grow at the highest CAGR in the market from 2017 to 2022, due to the growth in demand for homofermentative inoculants among silage farmers and the advent of combination products in the market by key manufacturers. On the basis of silage crop, the corn segment is projected to grow at the highest CAGR during the forecast period, as crop growers prefer the efficiency of corn silage over other crops in gaining better results, abundant production of corn silage in North American and European countries, enhanced productivity, and increase in application of corn silage in biofuel industry. On the basis of form, the liquid segment accounted for the largest market share in 2016, due to the increased preference for liquid additives owing to their ease in handling, storage, and transport. Liquid concentrates are highly preferred for application, owing to the increased use of chemical additives in developing countries. The North American region accounted for the highest adoption of silage additives in the livestock industry in 2016, owing to the growth in awareness and increase in the production of corn silage in the US and Canada. 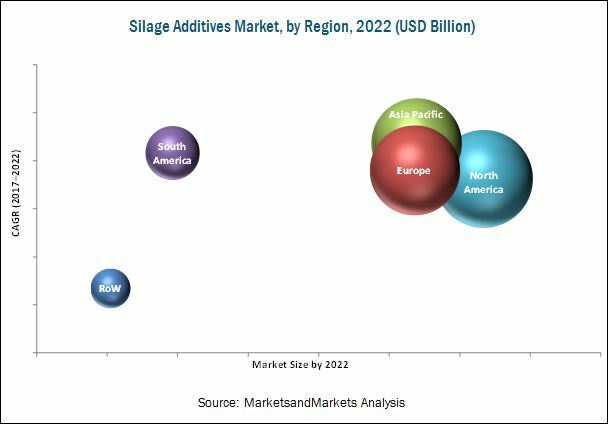 Asia Pacific is projected to be the fastest-growing region for the silage additives market in agricultural applications from 2017 to 2022. The significant growth of exportable commodities from the dairy sector, in order to meet the export quality standards, strengthened the market potential for local silage additive manufacturers to develop various products based on organic acids, NPN nutrients, and sugars. The silage additives market has been evolving with various manufacturers involved in the research and development of cost-effective, productive processes to reduce the prices of the silage preparation. The popularity of silage additive products depends on the understanding of its constituents and benefits, among farmers. Owing to the awareness about the effectiveness of these specific additive types, companies extract them and provide them as ready-to-use end products in the market. The information gap caused by misplaced marketing about the concept of silage additive serves as a challenge toward the growth of the market. Key players identified in the silage additives market include Volac (UK), Trouw Nutrition (Netherlands), Schaumann BioEnergy (Germany), ADDCON (Germany), Chr. Hansen (Denmark), BASF (Germany), Lallemand (US), DuPont, Pioneer (US), Micron Bio-Systems (US), Biomin (Germany), American Farm Products (US), and Josera (Germany), as these are well-established and financially stable players that have been operating in the industry for several years. Most key participants have been exploring new regions through expansions, acquisitions, mergers, and joint ventures across the globe to avail a competitive advantage through combined synergies.